To do the type of work that I do, I look for inspirational people to keep me inspired to reach for the stars and to profile in the newspaper to inspire our community to be successful in our endeavors. One of the young homies, Jesus El, is just that. I have known him since he was in middle school, where I remember him being a sharp little youngsta from West Oakland 15 years ago, when I worked as a mentor at the Lowell Village Center afterschool program. M.O.I. JR: Can you tell the people a little bit about what you do with the Warriors and how you got started? Jesus El: My name is Jesus El. 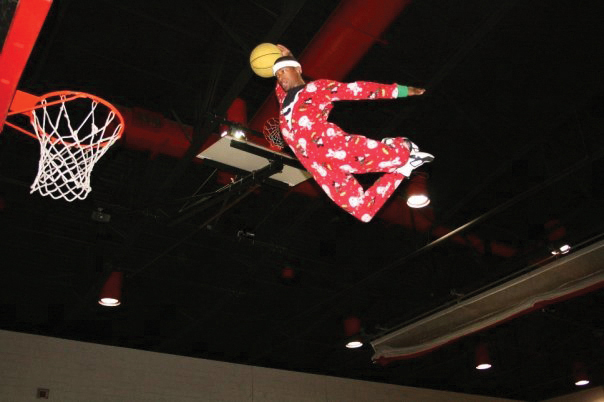 I am an acrobatic slam-dunker and dancer for the Golden State Warriors NBA team. 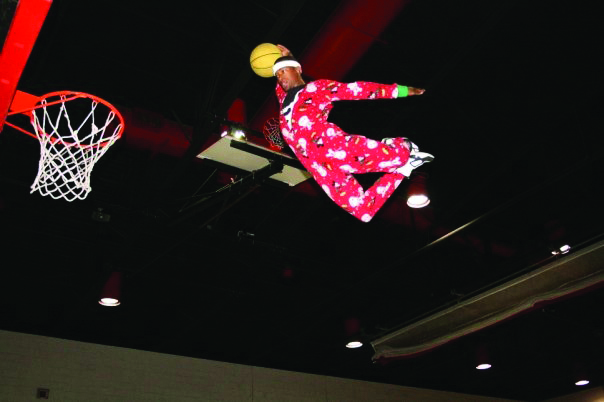 The name of our dunk team is “The Flying Ws.” The Flying Ws are a team of local talent that amazes the crowd with their high flying acrobatics and funny antics. When I was in the fifth grade, the Golden State Warriors mascot “Thunder” performed for my elementary school. Through his positive message and energy, Thunder brought inspiration to me and my classmates. I felt that he had truly brought my ideal superhero to life. Ever since then, I have dreamed of becoming a superhero that many kids could look up to. During middle school, I attended a Golden State Warriors game in order to watch Thunder perform his phenomenal acro-dunking show. After the game, I approached Thunder and asked him how I could become a good mascot. He suggested that I go to Head Over Heels Gymnastics, a training facility located in Emeryville, California. The next day I convinced the woman coordinating the programs at Head Over Heels Gymnastics to allow me to enroll in some classes in exchange for performing work around the gym. After training for one year and securing a position as my school’s mascot, I began to call Thunder three times a day, every day, to demonstrate how serious I was about becoming an acrobatic performer. Thunder eventually called me back, and our conversation led to him inviting me to train with him. I trained with Thunder for three years. During this time, he motivated me to always strive for excellence in all areas of my life and modeled what it takes to be a professional performer and community leader. M.O.I. JR: How much do you train, practice and work out? Why do you work out that much? Jesus El: Elandis Brooks and I started a program called “Boys to Eagles,” which would train youth around the Bay Area. The youth would learn acrobatics, dancing, dunking and the necessity of articulating yourself to change lives. The Boys to Eagles program trains four times a week. We train so much because we know that learning is most effective with repetition. Also we aim to keep ourselves and our youth as active as possible. M.O.I. JR: Where are some of the places nationally that your job has taken you? Who are some of the important people that you have met? Jesus El: I’ve been all over the United States: California, Texas, New York, Utah, Chicago, Kansas, Connecticut, Orlando, Miami, Indiana, Philadelphia, Cleveland, Oklahoma City, South Carolina, Colorado etc. I’ve been to a lot of places nationally, but there are still some cities that I haven’t had the chance to enjoy. I’ve met Michael Jordan, Dawayne Wade, Lebron James, Jerry Springer, Destiny’s Child, T.i., Jay-z, Jermaine Dupree, Ciara, Snoop Dogg, Diddy, Redman, Method Man, Dominique Wilkins, Clyde Drexler, Cedric the Entertainer, Doctor J, a few cast members from the show “Girlfriends,” Vivica A. Foxx, Nelly, Shaq etc. The list goes on. M.O.I. JR: Can you tell us some of the places that your job has taken you internationally? How did the people in these other countries respond? Jesus El: Internationally I’ve been to a few places but still look forward to studying religion and perfecting wisdom on every continent. I’ve been to Mexico, Canada, Amsterdam, Abu Dhabi, Dubai, Japan and to China seven times. The people greeted us very well. I look at my international trips as a vacation – time set aside to grow spiritually – with wise people in their homeland. I’ve been searching for the answers to many different religions, and traveling teaches me how to understand all cultures, religions and walks of life. M.O.I. JR: How much do you travel on the regular with your team? How has all of this traveling changed you? Jesus El: I travel two to three times a month. I’ve changed dramatically due to the traveling. I started as a young boy surviving in the streets of Oakland with no real guidance of what a Black man should be in this society. I didn’t know anything outside of what I would see on the day to day basis: genocide, prostitution, drug dealers, gentrification, drug abusers, homeless people and lost youth just like me, in search of a father that was as noticeable as the wind. Then as I begin to travel, I would see that poverty, prostitution, dealers and substance abusers exist everywhere. Actually, in some other countries, I’ve seen worse living conditions than we have in the U.S. People don’t understand why foreigners want to move to the U.S. and start over. The United States is the land of opportunity, yet most Americans sit back and complain about what they don’t have, and foreigners come to America with a dollar and a dream and grow rich. Traveling has made me understand that we all are children of God and someone always has it worse than you, so be grateful. Also, I’ve learned wise teachings to make my mark on lives no matter where I go. M.O.I. JR: Can you tell us about this program that you and you buddy started? Besides gymnastics and hoop, what are you teaching them? 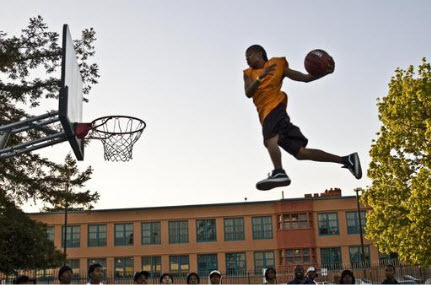 Jesus El: Show time Entertainment dunk team and The Boys to Eagles program is geared to encourage youth on setting goals, fulfilling dreams and changing the lives of other people. 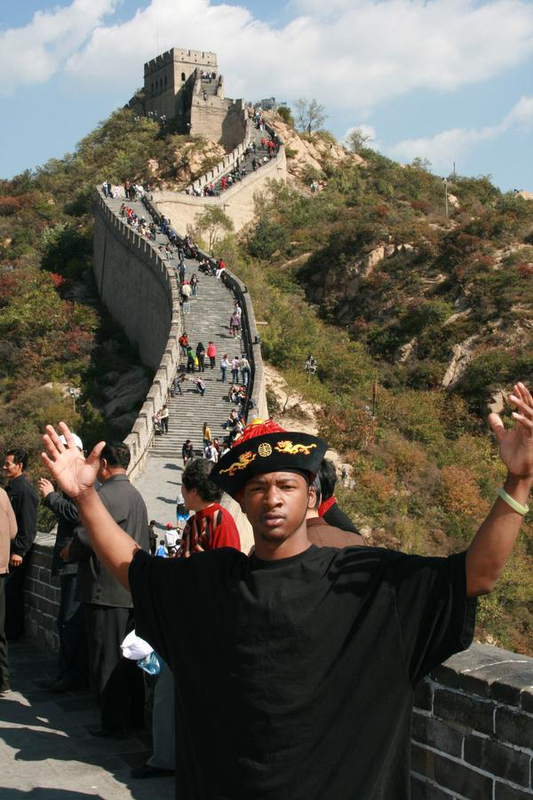 The program not only helps train acrobats, but musicians, video journalists, dancers and entrepreneurs. We often meet youth that have amazing abilities, with a list full of dreams and the zeal to accomplish them; however, their skills need to be perfected and their outlook on life broadened. This program teaches the young men to not be fearful of attempting to be the best you can be. Every Friday we have men’s meetings – to sit down and confront some issues that we’ve all had or are currently dealing with in life, such as school, family, friends, pain, dreams, goals, women and transforming the thought which stops the enablement of one’s success. I often find it to be enlightening when I sit down with the members and coaches of the Boys to Eagles program and hear the stories of many men in search of a greater side of themselves. M.O.I. JR: Where do you want to go with this program in the next five years? Jesus El: Five years from now I would like to see our youth transform into strong men with integrity, drive, academic development, and a caring heart to help others. This program is encouraging people with great opportunities to reach out to the youth and help change their lives for the better. Also, we would have given them skills to produce media, music, businesses and value. I would actually like us to travel around the world doing a showcase of all our talents combined into one show, while delivering powerful messages about the power of persistence and repetition. M.O.I. JR: Do you have anything special coming up where people can come see you do your thing? Jesus El: Every home Warriors game. Jesus El: We can be contacted at facebook.com/jesus.el3 and jesus@showtimedunk.com. Or hit me up at jesusel03@gmail.com. EAGLES OF DEATH METAL, UN agency were thrust into the headlines on November thirteen once a mass shooting at the band's Paris concert left nearly one hundred folks dead,sat down for associate on-camera interview with vice to talk concerning the tragedy.